Cypsela in her heydays opened a new page in the design history due to her innovative solutions and her victories everywhere around the Mediterranean. She was also a main player in the classic boats renaissance and even made a famous circumnavigation. Today, she is in good shape, in need of a caring new owner. Water Tank:2 x 90 l.
At the beginning of the Fifties, Jack Laurent Giles received an order for a boat that was to be a racing winner without any further restriction: she was to be used just to win! The Miranda IV, launched by Baglietto in 1951, amazed by her daring lines where her rudder was clearly separated from the fin keel and the hull had tense lines with a short wetted surface, on a way not seen since more than sixty years. Just some designs from Uffa Fox in the Forties had tried to revive this particular style. Miranda's victories everywhere in the Mediterranean immediately drove to emulation and Giles obtained many orders with the same mission: "to beat Miranda". In 1952 and 1953 he designed two very different boats, the Italian Nina V and Spanish Cypsela. The former was a full keel vessel of abundant displacement and powerful rig. She had an innovative deck lay-out with a central cockpit (today, Nina V is being offered also for sale, through Barcos Singulares). The Cypsela, at the opposite, was designed in the wake of Miranda's light displacement philosophy, with a rudder suspended to a skeg and a flush reversed sheer deck. Both reached their goal of winning Miranda, but this last did not leave them an easy life! Miranda and Cypsela will remain for the history as the beginners of a battery of new ideas that were about to impose themselves in the years to come: the separate rudder on a skeg, the fin keel suspended by bolts, the ultralight building with wooden layers (Cypsela has two layers, the one inside is diagonal and the external one is horizontal, both mahogany and separated between them by a layer of cotton canvas), reduced overhangs and reversed transom. On the Cypsela the flush deck spots a short trunk, in line with the fashion of the moment and with a tipical Giles design. The mast is placed amidship and its mast step is on deck. The reversed sheer (that Giles introduced in 1947 with the Myth of Malham) gives to the vessel a futuristic feeling that Giles used often in the Forties and Fifties, for rating reasons and for better interior space. The sideways are uncluttered and allow for quick and safe manoeuvering. The cutter rig, with fractionated sails, favour the handling in any weather. Down below, Cypsela has a better liveability compared to that of Miranda, thought being a smaller vessel. Giles put three separated cabins, plus the saloon: a world revolution for her time. Cipsela's life has been varied. She has always been in the same Company's ownership, this last being sold five times in total. In the Fifties and Sixties she raced with an extraordinary out-come. Then a quieter period followed with deterioration. When the present owner found her, toward the mid Eighties, she was pretty abandoned and in need of deep work. She had her planks and water ways nailed again, a new cockpit and interior, new caulking. Her owner's involvement in the classic boat's renaissance, drove Cypsela to any Mediterranean racing field, winning many awards again (Porto Cervo, Almirante Conde de Barcelona, etc.). On the second half of the Nineties, the Cypsela and her owner with his family started for a circumnavigation of many years. In 2004, while in Phuket, Thailand, the Cypsela had a deep restoration with the replacement of some bulk-heads, the chain-plates. Two new beams and the others nailed again, new mast step, a new transom and many more. Today she is still in good general shape, in need of some cosmetic painting and varnishing work. She is a vessel that can endure whatever to come, from races to long distance cruising. She has a perfect interior lay-out, very good performances under sail and a unique history to tell. These details are believed to be correct but not guaranteed. This specification can not form part of any contract. The purchaser should instruct his surveyor and/or agent to investigate any detail he wants validated. 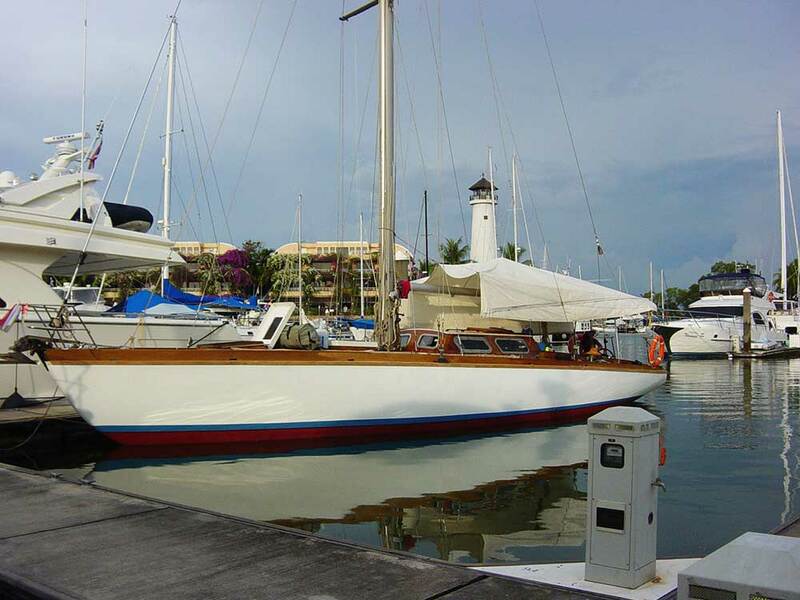 The boat is offered subject to prior sale, price change, inventory change or withdrawal without notice.